Well, no bordeaux or Pink for the solstice. Guano. ButI did find a nice bottle of DaVinci Chianti from the town of Vinci in Italy. It’s probably been close to thirty years since I had a glass of Chianti. Tasty. I even picked up some pasta sauce and parmesan to go with the spaghetti rather than prepare it in one of my usual ways. In the morning, I went out and gave thanks for a couple of hours, mid-day I worked with silver at my bench, and late afternoon went for a brisk walk. A little before twilight I poured a glass of Chianti and took M&M for a walk. Afterwards I sat down to a bowl of brown rice pasta and Vivaldi’s Le Quattro Stagioni. I wrapped up the day with a second glass of Chianti, a book, a feline on my lap, Vivaldi’s Complete Works for the Italian Lute, and Orff’s Carmina Burana. So, once again, the 21st was made specialsimply. Happy New Year, Earth, from one who cares. M&M didn’t want to go out for three days. That never happened before. They always want out, if even for only a few minutes. 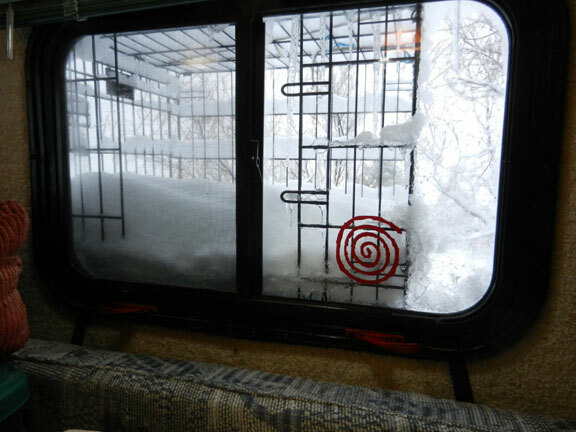 They did not even want to sit out in their window cage. Never did figure out why. 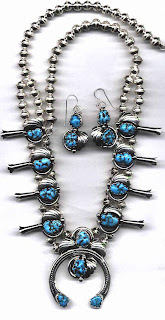 Many people enjoy silver jewelry of the southwest Indians. I thought I’d post some of what I know about it. Years ago I did quite a bit of research and put together a PowerPoint presentation. I pulled this entry from parts of that file. Might as well start a little further back. People first mined silver for jewelry in the Bronze Age, 2300-1200 BC (Is this too far back?!). Silver was pretty easy to find all over Europe and West Asia. The big problem was, silver ore (the rocks that had silver in them) generally also had lead in it, so that lead mining and silver mining were the same thing. But lead is not the healthiest of substances, so the men who were mining the silver were also being poisoned by the lead. Most lead-and-silver miners died of lead poisoning in two or three years. Because of this, most free men wouldn't work in the mines, and so they forced slaves to work in the mines instead. What a concept. The Egyptians considered gold to be a perfect metal, and gave it the symbol of a circle. Since silver was the closest to gold in perfection, it was given the symbol of a semi-circle. Later this semi-circle led to a growing moon symbol, probably due to the likeness between the shining metal and the moon glow. Silver is the most lustrous/reflective metal. Today, the 300 or so silver mines in the world use both underground and open-pit mining. Of these mines, very few are producers of pure silver. Rather, most silver (80%) is produced as a bi-product of other ores such as copper, lead, gold, uranium and zinc. The deposits in Canada, the former Soviet Union, the U.S, and Mexico account for more than 80% of the world’s silver resources. The word ‘smith’ means ‘to smite,’ to hit or strike. Basically it means that hammers are used for shaping. A traditional silversmith frequently begins with a thick piece of metal called an ingot. The ingot is hammered until it is thin. Traditional silversmithing is fabricating large objects from silver using hammers and various stakeschalices, serving trays, silverware, vases, etc. and repairs. NOT techniques used by the Indians in the southwest. You are all familiar with the work of a famous traditional silversmith from the 1700’s. And what is he known for? Riding around on his horse one night, shouting and waking up all his neighbors. This photo shows some of Paul Revere’s work (from his day job). Contemporary silversmithing is really ‘goldsmithing’making small works of art out of precious metal. Indian jewelry is recognized worldwide as a dynamic and stellar art form indigenous to the culture and heritage of the Indian tribes in southwestern United States. The art style is almost all hand-crafted work (or, at least it was). Can’t talk about southwest jewelry without saying something about turquoise. Turquoise found in the Hohokam excavations in southern Arizona dates back to 200 BC. Prehistoric Indians mined turquoise and turned this mineral into jewelry, primarily drilled beads and other hanging ornaments. Turquoise is a semiprecious, opaque mineral composed of hydrated copper and aluminum phosphateone reason it is found in copper mines. The ‘sky stone’ is an ancient talisman for health and happiness. It’s typically greenish-blue. Stones with more copper content appear bluer, while those with less copper and more iron are greener. Sometimes it has a rock matrix and varying shades of gray, brown or black veining due to inclusions or oxide stains. Bisbee turquoise is known for its dark matrix. Quality varies. Turquoise from the Sleeping Beauty mines in Arizona generally rates very high. Turquoise found in excavated mounds east of the Mississippi have been analyzed and proclaimed to be from out here. That’s pretty cool. It shows the existence of trading in the lifestyle. It also provides a glimpse into probable status levels of the people. Okay, here we go. 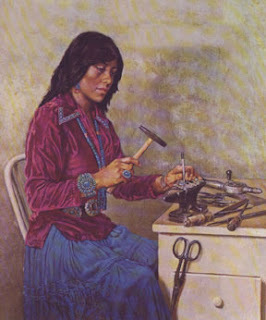 It is generally believed that the Spanish colonizers of the Southwest purposely kept the techniques of metalworking from the region's native peoples. Kind of understandable (Here, let us show you how to make metal arrowheads that you can then shoot at us.). Southwest Indian jewelry can all be traced back to one Navajo, Atsidi Saani (which in English means Old Smith). Atsidi Saani learned the art of the blacksmith, working with iron, from a Mexican named Nakai Tsosi near Taylor Mt, in AZ in the 1850's. Atsidi Saani had hoped that by learning the trade he could make and sell the silver bridles and headstalls that the Navajo Indians were buying from the Mexicans at that time. He applied his metal working techniques, as appropriate, to silver, and he began to teach his four sons and others in his family the silversmith trade. Navajos were taken on the ‘Long Walk’ in 1864 to Fort Sumner and then confined to the Bosque Redondo (Round Thicket) reservation on the Pecos River until 1868. When Navajo people returned to their beloved mesas and canyons, their new, more settled way of living led to many changes. Among other things, as they were no longer nomadic, they had greater opportunity to learn from each other. The Navahos had long admired and used metal ornaments and horse equipment. They had used brass and copper wire to create bracelets and coins to fashion buttons. In the early years, between 1870 and 1920, tools were crude. Smiths improvised and created their own crucibles and bellows. For abrasives, they used powdered sandstone, sand, and ashes. A smith may have only had a hammer, large rough files, handmade stamps, a slab of rock for soldering and annealing, and a length of scrap railroad track for an anvil. Smiths did not have dividers, squares, or rulerssymmetry was by eye. Casting molds were carved out of tuff, a volcanic ash similar to pumice. The dust is very fine. The molds would crack after less than a dozen pourings so sometimes the mold would be carved out of hard rock. It was much harder to do but the mold would last indefinitely. Early smiths sat cross-legged on the dirt floor of their Hogan or outside. Silver was obtained from silver coins (silver dollars, fifty cent pieces, and quarters), which were melted down for casting or hammered flat and annealed. The decade of the 1870s had been a time of experimentation, of mastering the fundamental skills of turning silver coin into articles of adornment. The 1880s saw an expansion of both in the number of objects created and in the variety of their shape and decoration, and this development continued in the 1890s. This time is called the Classic Era. In 1890 the US government forbade use of American silver dollars by silversmiths. Guano. The Mexican peso soon gained new favor among smiths because of this and it also had a higher silver content than American coins (95% as opposed to 90%) so it was softer and easier to work with. Can you guess what happened next? Yep, the Mexican government later forbade the exportation of their pesos. Hard to work with silver when there’s no silver. Often a local trader would give the Navajo smiths silver in the form of candlesticks, teapots, etc to melt down for their work. 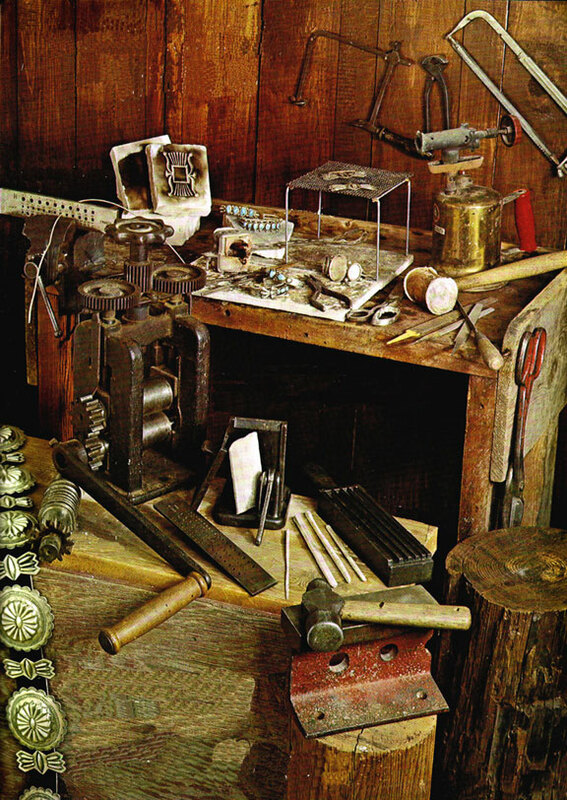 In the 1880s, traders took advantage of the new market with silversmiths and began selling toolspliers, drawplates, sand paper and most significantly, small fine files. They also sold or traded silver slugs. Each slug weighed an ounce and was approximately 1½" square and about 1/8" thick. These slugs where hammered flat and fabricated into a finished pieces of jewelry. Navajo women did not begin to make things from silver until 1918. They watched their husbands and started to assist them with some of the more tedious tasks. Some women picked up enough to go into business for themselves. But even today, the men far outnumber women in this craft. 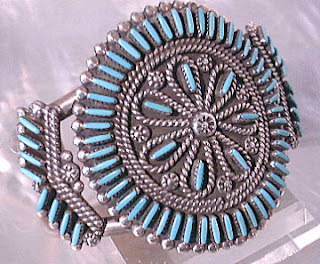 The best known example of Navajo silver work is the wire bracelet. The earliest Navajo work consisted of hammered work with file decoration and hand stamping. Fine files unlocked the gate to a vastly extended field of decoration with more intricate designs. 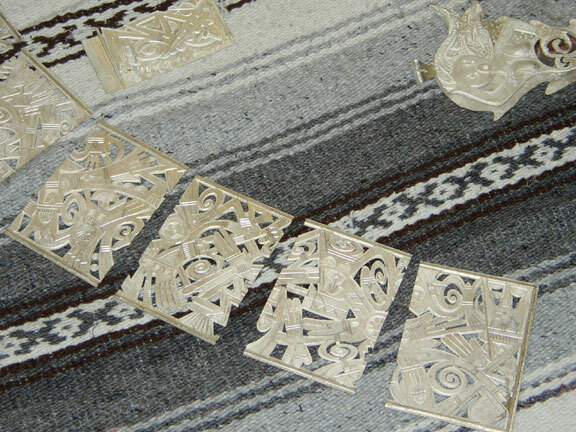 At first, the dies Navajos carved into the ends of scrap iron were copied from stamps used by Mexican leather workers. There were substantial improvements between 1920 and 1940, which factored into the increased output of jewelry during this period. A gas torch replaced the blowpipe and charcoal. It offered more controlled heat for soldering and annealing. A rolling mill enabled a smith to roll out a silver slug in a fraction of the time it takes to hammer one out by hand. Sheet silver, introduced in the 1920s by the federal Arts and Crafts Board, replaced slugs. And wire was commercially drawn, saving another time-consuming process. Although the Navajo revere turquoise for its beauty, firmly believing in its magic qualities, in their jewelry, silver is of first importance. Turquoise is used to set off and balance the areas of polished silver. As one way of enhancing silver, Navajos use die work with great skill. A negative die, one in which the design is sunk into the surface rather than raised above it as in a positive die, was made by striking a positive die into the heated end of another steel rod. You’ve probably noticed that triangle wire is a characteristic of Navajo design, found on rings, buckles, bracelets, ketohs (bow arm guards), najas, and bridle members. It does have a pretty distinct look. I like it. The early Navajo silver work concentrated on concha belts, bracelets, bow arm guards, buttons, and silver bells made from quarters. 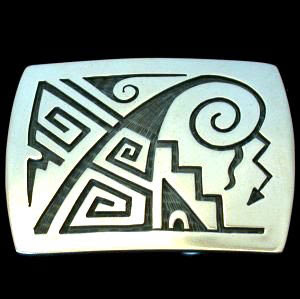 There are designs dating hundreds of years ago that were found etched on the walls of caves that are being used in jewelry that is made today…such as the famous hunched back flute player Kokopelli. Perhaps the most important technical advance Navajo smiths made during the 1890s was to learn to set stones in silver. A stone is fastened to metal by a narrow strip of silver that surround the stone, gripping it tightly. This bezel is anchored to the ring or other object by solderinga delicate process and one that requires a controllable source of heat. After the Navajo learned to set turquoise in silver, they started using other stones less scarce than the valuable turquoise: native garnets, jet, and malachite and occasionally bits of abalone shell and even pieces of colored glass were set. Turquoise was scarce initially, until larger modern (for the times) mines opened up sources for it. It then started to be used extensively in jewelry. 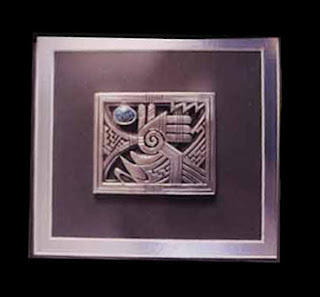 One popular technique used to embellish a piece was appliquésoldering small decorative piece of silver onto it. Another was repoussagethe formation of patterns in relief by hammering or pressing from the underside. They usually combined this technique with stamping, as each sets off the other. The best-known type of necklace has got to be the squash blossom necklace. I think one started seeing them in the 1880’s. Some of the early Spanish designs inspired the crescent, the silver naja, and the pomegranate blossom (now referred to the squash blossom) and became key to Navajo jewelry design. In 1872, Lanyade, a Zuni, learned silversmith skills from a Navajo named Atsidi Chon (Ugly Smith). Chon and Lanyade became friends (maybe stemming from the fact that Lanyade was one of the few Zuni who could speak Navajo). Chon came to live for a year with the Zuni. Chon worked in Lanyade's house and would not let anyone watch him work so the Zuni would not learn how to make things from silver. He felt if they learned how, he would not longer be able to sell his silverwork to them. Makes sense to me. Since Chon was living in Lanyade's house, Lanyade had an opportunity to observer Chon at work. Lanyade later traded a horse to Chon in exchange for Chon teaching him to work with silver. After Chon went back to the Navajo reservation, Lanyade had to make all his own tools. For the first few years, like Chon, Lanyade did not let anyone watch him do silverwork so he maintained his market. Sounds familiar. 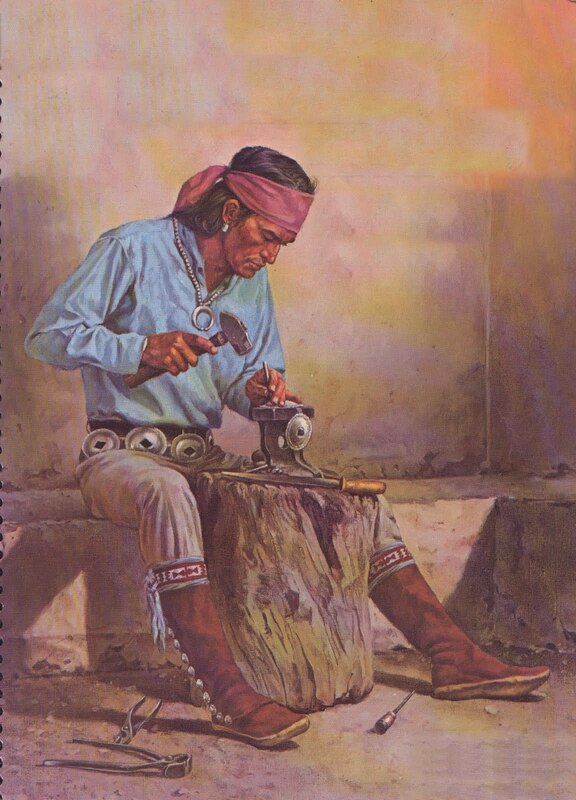 As with the Navajo, the craft is usually learned, quite informally, from a relative, first by watching, then by helping to do the easier, more monotonous tasks (forming bezels, grinding stones, sanding, etc). This aid was frequently accepted in place of a fee. 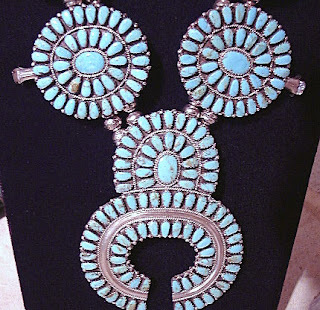 The Zuni's long-time preoccupation with stones had an enormous effect on their jewelry. The fundamental interest of the Navajo smith, as stated, is silver. He has an innate understanding and love of silver for itself. Softly gleaming surfaces of the ‘metal of the moon’ delight him. 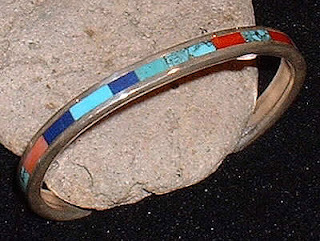 Because Navajos feel the beauty of the metal, their work tends to have weight and substance. The Zunis, by contrast, have an inherited love and understanding of stones. Silver they look on merely as a means to hold stones, or as embellishment to set them off. Their work might be said to be more ornate. Cluster jewelry might possibly be the most characteristic Zuni motiffrequently the stones were cut into small teardrop shapes. Rows of stones and the needlepoint style share popularity with clusters. Zuni had been known for their lapidary skills for hundreds of years. They carved fetishes out of rock and made beads. 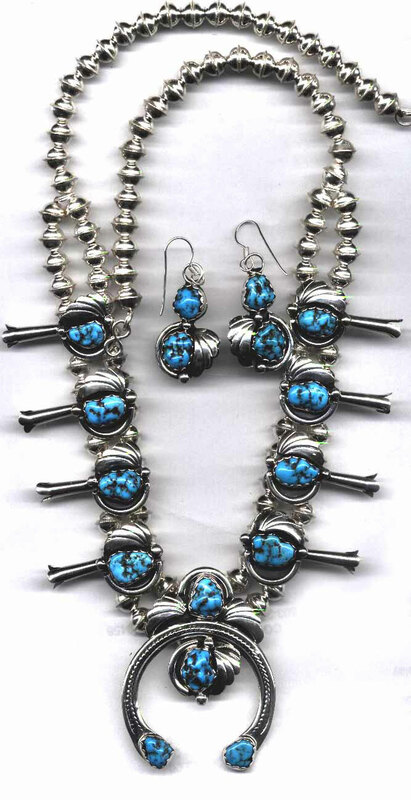 The Zuni artist characteristically creates jewelry crafted from sterling silver, turquoise, coral, jet (fossilized coal [a kind of petrified wood that has formed beneath the sea]), and mother of pearl. Each individual stone or shell is painstakingly hand-cut, press fitted together, sanded level and then polished to form a seamless mosaic of color. The introduction of the emery wheel made the process go a lot faster. In the 1890s, Zunis started to set stones into their work using bezels. In the 1920s, the Zuni developed their inlay patterns of multi-colored stones and shell in mosaics and channels (stone set between strips of silver). The settled Pueblo way of life provided better working conditions than that of the semi-nomadic Navajo, one thing being a permanent forge on a frame high enough so that the Zuni smith could work standing up. The whole design of Zuni jewelry was oriented to the display of gems. Plain areas of silver suitable for stamping were gone. Decoration by die work had disappeared. 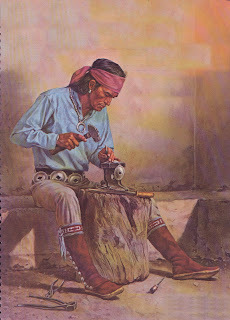 Now to my favorite, the Hopi, the last to adopt silversmithing skills. After the massacre at Awatovi, the Spaniards left the Hopis in peace to live on their remote mesas and cultivate their fields. Thus the Hopis had little chance to envy the silver that bedecked the conquistadores. They were also more of less, out of the loop. They did not move about as the Navajos did, nor were they near Gallup, like the Zunis, so there was not the temptation to go there for trade and to see the sights. They used horses and wagons little. With their agriculture and crafts the Hopis were pretty much self-sufficient. Lanyade began touring the various pueblos selling his jewelry. While on Hopi First Mesa at Sichomovi, in 1898, he stayed with Sikyatala (Yellow Light) for four months. Lanyade would not teach the Hopi how to work with silver (sound familiar?) but from watching the Zuni work, Sikyatala picked up enough to learn the fundamentals of the art. After the Zuni left, Sikyatala bought some tools and tried his own hand at working with silver, which he sold to other Hopi. 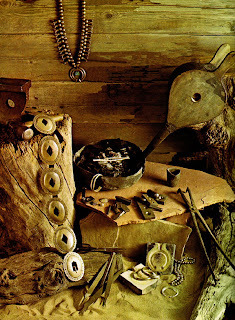 As Lanyade was taught by a Navajo and the Hopi taught by Lanyade all the jewelry of the period was Navajo in style. Silversmithing did not catch on in Hopiland as it did at Zuni and among the Navajos. Hopi weaving was big business, supplying not only home demand but also that of Zuni and all the Rio Grande pueblos. And because both weaving and silversmithing among the Hopis are masculine crafts, they compete for the time of the men, who must also labor in the fields and take part in lengthy ceremonials. Among the Navajos, it is the women who weave and the women and children who care for the flocks; the men are comparatively free. Hopi silversmiths worked at their craft only in the winter, when they were not needed in the fields. In 1938, the Museum of Northern Arizona in Flagstaff, working with Hopi silversmiths, Paul Saufkie and Fred Kabote, began a program of developing a style that was exclusively Hopi. The work was interrupted by World War II. 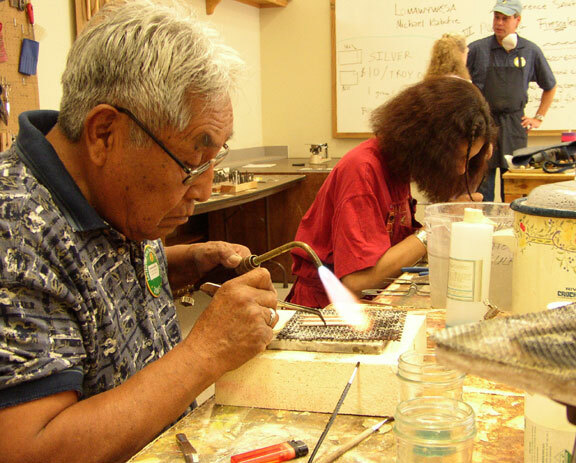 Following the war, a government grant helped the Hopi Guild with a silversmith training program. A Quonset hut was set up and the first class started in 1947 with thirteen men. Casting and overlay were taught as well as basic silversmithing. Students used copper to learn on, then silver as they became more competent. The ‘overlay’ technique they created involved the cutting of designs in a heavy gauge silver sheet and then soldering this to a thinner solid silver sheet. The base piece was hand stamped and oxidized. The contrast between the polished areas and those still dark heightens the sculptural quality of overlay. The designs were usually adapted from the pottery shards found in the Sikyatki Pueblo ruins of the 15th and 16th centuries. These pre-Hopi designs were mostly bird motifs. The Hopi Guild also used kachina symbols, animal and clan motifs, and patterns from basket makers, weavers, and potters. One prominent characteristic of Hopi patterns is asymmetrical balance, which provides a startling contrast to the static centering of Navajo and Zuni creations. Another conspicuous trait is fluid curving lines, vividly suggesting movement. Lawrence Saufkie, son of Paul Saufkie, was awarded an Arizona Indian Living Treasure status. He lives up on Second Mesa on the Hopi Reservation in AZ. The three legged bear is one of Lawrence's classic designs. 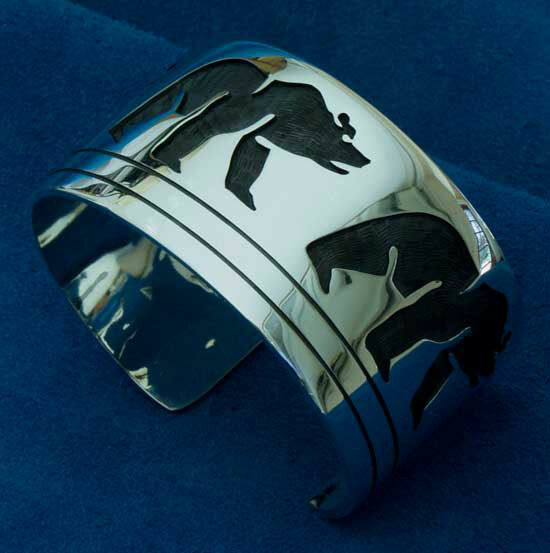 Michael Kabotie, son of Fred Kabote, is another celebrated Hopi silversmith, as well as a painter and poet. I had the good fortune to take a week-long class with these two a number of years ago. The photo is of Lawrence Saufkie at one of the soldering stations and his home setup is pretty similar. Not exactly high tech nor does it take a lot of tools to make jewelry like this. At the time, Michael was working on a set of panels that would be soldered together and set behind glass. The commercialization of the craft began in 1899 when the Fred Harvey Company first started to order silverwork made up expressly for Anglos who were passing through on the trains. In the 1920s, with California opening up as a resort center and the automobile being used more and more to transport the ever-growing number of tourists, the demand for Indian souvenirs became insistent and practically insatiable. Much of the silverwork degraded to cheap, fast-produced trinkets, often stamped out by machines. 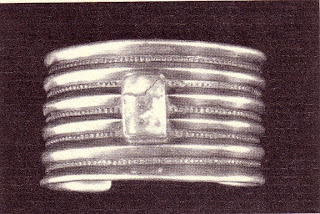 Some Indian jewelry from this time was made from German silver rather than sterling. German silver does not contain any silver whatsoever. It is an alloy of copper, zinc (brass), and nickel. Adding nickel to brass changes it to a silver color (but it looks more like chrome to me). Thinner gauges of silver also became prevalent. This thinning the silver, however, destroyed the important three-dimensional quality of the design. It could look pretty chintzy. Luckily things started to occur in the 1930’s and ‘40’s to bring good craftsmanship and high quality back into the trade. Each of the distinctive Hopi, Zuni and Navajo silversmiths have a style unique to themselves but over the years, these smiths have evolved from the traditional turquoise based silver jewelry to a more contemporary use of different metals and multi-colored stones. 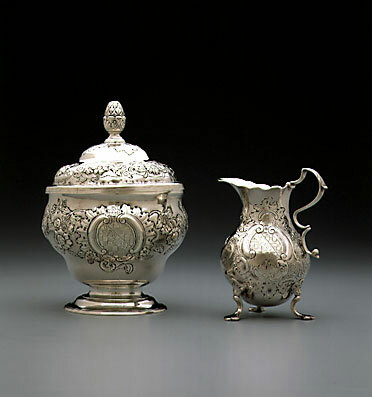 Today's Indian silversmiths are in many cases also goldsmiths and lapidaries as well. They cross tribal design boundaries with a will and with abandon. No longer can one look at a piece and say ‘It's Zuni style so it must be Zuni made.’ The artist of today may incorporate in a single piece all the styles available as well as his or her own innovation. Indian jewelry today transcends tribal styles. Over many generations they have developed their skills, talents and designs into an art form all their own. Many people from all over the world have come to appreciate and love the look of the southwestern jewelry that they handcraft today. December's sixty minutes sixty years: it was tough making the 1800 this month. I racked up 8 zero-minute days during the first four weeks so it was a scramble to make up those 480 minutes in addition to the 60 minutes a day. The weather was definitely a factor. I don’t like to exercise indoors and in the casita, the floor space is roughly only 2’x7’ with a low ceiling. Movements are somewhat limited. But, the appeal of meeting the challenge finally got through and with a hard last week I bagged it with 1900 minutes. Sure hope this does not happen again. The license plate read: RETRDfor ‘retired.’ That was not my initial interpretation.